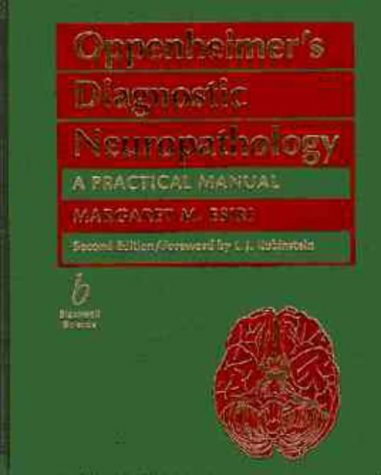 Oppenheimer'S Diagno Stic Neuropathology: A Practical Manual: 9780865429154 Hardcover - LIMEROCK BOOKS INC.
Oppenheimer's Diagnostic Neurpathology is a guide to neuropathological methods, focusing chiefly on the immediate questions facing the neuropathologist in the post-mortem room: for example, what had caused this patient's epilepsy; why was he so weak; or why, after what seemed to be a successful neurosurgical procedure, did he suddenly die? Full of practical advice and observations often omitted from standard textbooks of neuropathology, this is ideal reading for general pathologists as well as apprentice neuropathologists. Margaret Esiri DM, FRCPath, is a Professor of Neuropathology at the University of Oxford, and Honorary Consultant Neuropathologist at the Oxford Radcliffe NHS Trust. After preregistration training posts in medicine and obstetrics, Professor Esiri undertook training in research in the Anatomy Department, Oxford, and then trained in general medicine and neuropathology. She held and MRC Senior Clinical Fellowship in Oxford before being appointed Reader and then Professor of Neuropathology at Oxford. Daniel Perl is a Professor of Pathology (Neuropathology) at the Mount Sinai School of Medicine in New York.